"The IPCC Special Report was a wake-up call for the global economy. There is an urgent need to step up ambition in order to meet the goals of the Paris Agreement and avoid devastating global warming," said Alexander Farsan, Global Lead for science-based targets at World Wide Fund for Nature, one of the Science Based Targets initiative partners. "Companies have a vital role to play in realizing this goal. The latest science from the IPCC has shown the way forward. We urge companies to raise the bar and set the pace of change that we know is needed." The SBTi is a collaboration between CDP, the United Nations Global Compact, World Resources Institute (WRI) and the World Wide Fund for Nature (WWF). 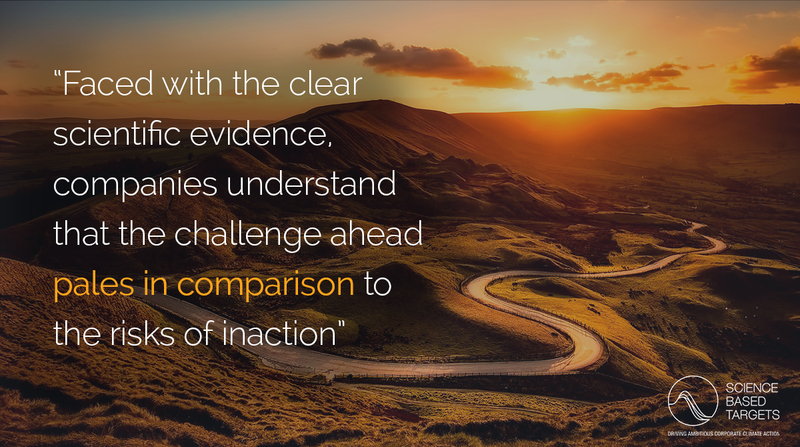 The initiative uses the latest available climate science to define best practice in science-based target setting, and independently assesses companies' targets against its validation criteria. Since its inception in 2015, the SBTi has approved targets of more than 160 companies, and an additional 350+ companies have committed to set targets within a two-year timeframe. The Science Based Targets initiative mobilizes companies to set science-based targets and boost their competitive advantage in the transition to the low-carbon economy. It is a collaboration between CDP, the United Nations Global Compact, World Resources Institute (WRI) and the World Wide Fund for Nature (WWF) and one of the We Mean Business Coalition commitments. The initiative defines and promotes best practice in science-based target setting, offers resources and guidance to reduce barriers to adoption, and independently assesses and approves companies’ targets. For more information, visit www.sciencebasedtargets.org and follow @sciencetargets on social media.